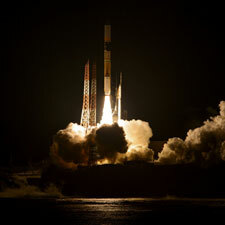 The Global Precipitation Measurement (GPM) Observatory was launched from Tanegashima, Japan on Feb. 28, 2014. The Mechanical Engineering Branch provides the engineering expertise to develop spacecraft and instrument structures, deployment systems, optical benches, and a vast array of other spaceﬂight hardware in support of Goddard Space Flight Center Projects. Branch engineers lead or oversee the total development of the hardware including the design, analysis, fabrication, assembly, integration, testing, transportation to launch site, launch and early orbit operations. The Branch also provides technical oversight, evaluation, and consultation to ﬂight projects, instrument developers, design review teams, anomaly review boards, technical evaluation panels, and source evaluation boards. 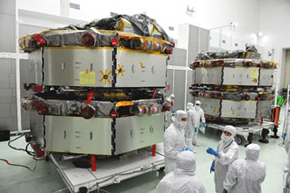 Four Magnetospheric Multiscale (MMS) Observatories (in two "mini-stack" configurations"), with Solar Panel covers installed, at AstroTech in Florida, November 2014. MEB personnel were critical to development and build of these four complex Observatories. 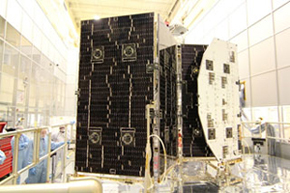 Deployment testing of the GPM Solar Array system in a GSFC Cleanroom. Development of this complex system was led by MEB personnel.